Now I have to think of the next one, any ideas on a subject? Whoa, you've got some crazy angles goin' on there! Great work! Location: A wanderer, for home is where the food is good and the company is better. Can't wait to inspect this more closely later. I honestly have absolutely no idea how you managed to pull something like this off, but excellent work. It seriously looks incredible, those are some crazy angles and textures. This is a very impressive build! I love the amount of texture you were able to achieve! Fantastic work! I love the feel, the lighting, the angles, the colors.... even the description under the flickr photo was interesting. You have a really great series going on. Blogged dy the Brothers Bricks. Congratulations. Very good photography and perspective. Wow thats is really great. The buildings are built wonderfully and the glowing of the fire is a nice touch. Well done. I really appreciate builds that defy the natural right angles of Lego, since such techniques are so challenging. 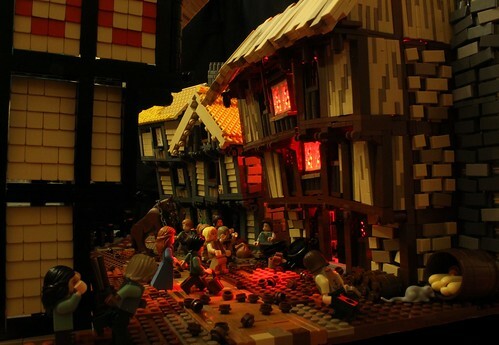 Greta job on both the build and the lighting, an impressive piece! Whoa, those are some crazy angles! Brilliant work!